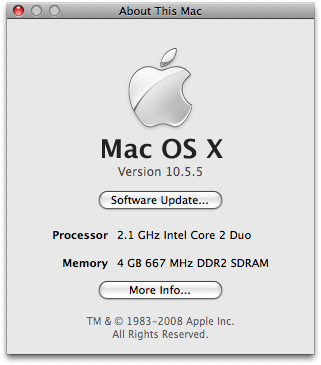 Today I upgraded my MacBook (early 2008) from 2×512 MB RAM to 2×2 GB RAM. The entire process took me 5 minutes, including the time to search for a fitting screw driver. It was far easier than expected. First turn over your MacBook, so the top is facing the table. Make sure you have a clean and soft surface to avoid any scratches. Use a 10 cent piece to turn the lock next to the battery to the unlocked position. The battery will pop out. 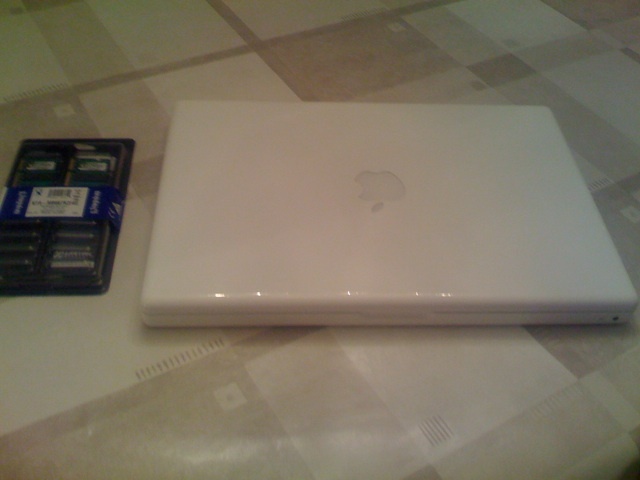 Use a cross screwdriver to remove the three screws of the plate protecting the memory and the hard disk. They are very small so use your smallest screwdriver you can find. Next pull the plate away, you now have access to the memory. By using the lever per memory slot the ram sticks will pop out making place for the new ones. Gently push them in until you hear a click.